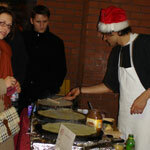 France in London | French Market at the French Lycée: What a day! French Market at the French Lycée: What a day! Once again the French Christmas Market has made everyone happy and delivered an early touch of Christmas magic. Its reputation precedes it and yet again, the event organised by French Fairs turned out to be a must-see with more than eighteen hundred adult visitors. Wondering why? Let's have a look at the feedback! 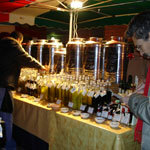 More than 70 sellers and their stands gathered at the Lycée: from French wine to jewellery, oysters to face painting, cashmere to pet accessories, crepes to puppet shows... everybody could find perfect Christmas gifts and avoid the habitual last minute panick on Christmas Eve, or just revel in the festive spirit! 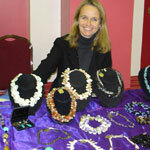 The choice was outstanding and some exhibitors came all the way from France especially. 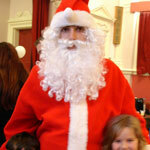 Even Father Christmas made a guest appearance! The French Lycée was definitely the place to be last Saturday. However the French Market was not only about food: fashion was also involved! Ladies could find beautiful cashmeres and designer clothes plus a large range of fashion accessories: jewellery, handbags, scarves, hats and, essential to every French woman, quality beauty products provided by Le Père Pelletier and Senteurs d'Orient. Every lady could find a suitable match and certainly seemed to, with a few husbands looking slightly worried as the testing turned to buying. Fortunately, wine sellers were there to placate all with generous free tasting sessions. For those who like a bargain, there was an ample selection to explore: from amazing home decorative objects such as the original lamps sold by L'Atelier Lo, and an array of French and English books at Book People who had no trouble finding buyers. Gosh, you are a cultured lot! In addition, two exhibitions of paintings and photography, as well as a a book-signing by Eric Simon for his guide "Londres, Ballades au fil de l'Ombre" marked the rhythm of the day. Nicest of all was the sound of children's laughter. No surprise since they had been so spoiled! They got a room of their own where they were kept entertained by happy helpers so that their parents could browse around calmly next door. Budding artists could practise their talents at the arts and crafts stand and within a few minutes of the face painting stand starting, lions, butterflies, princesses and spider men could be seen running about. Father Christmas took time out of his busy pre-Christmas schedule to collect letters and deliver an early treat (lots and lots of sweets), and let's not forget the puppet show which was a resounding success amongst the tough little critics. Although we enjoyed our first visit to the Lycee French Market, we were dissapointed,as we could not locate the Oyster Bar, where exactly was it to be found, did anyone else find it ?